By late last week, Bartlett Yard had been reduced almost entirely to rubble. Backhoes and frontloaders swarmed, tearing girders and piling bricks, while workmen sprayed down the heaps with fire hoses. For the past couple of years, Bartlett Yard had been that much-fabled thing, an urban oasis. 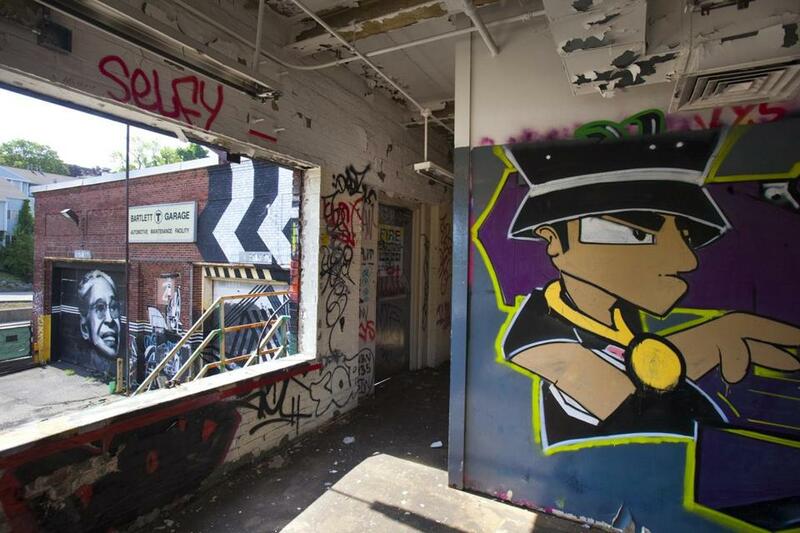 On what had been an 8.6-acre decrepit lot of an abandoned former MBTA maintenance facility on Washington Street, a few blocks from Dudley Square, graffiti artists brought color and created their own kind of collective urban narrative. During the summer of 2013, the Events at Bartlett Yard series offered music, dance, a clothing drive, even a lobster-boil picnic at the site. The Bartlett Yard cultural project had always been conceived as temporary, a kind of urban space saver until developers were cleared by the city to begin demolition. Neighborhood arts-event organizer Jason Turgeon, in partnership with Jeremy Alliger of the nonprofit Alliger Arts secured funding, pulled permits, invited artists, and helped bring skeptical neighborhood residents around to the idea of graffiti as art. 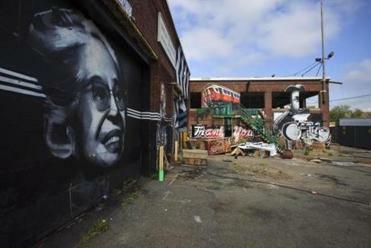 Gone was the portrait of civil rights pioneer Rosa Parks that had emblazoned a garage door, a mural of the Orange Line, and another mural dedicated to Melnea Cass, the Roxbury activist and organizer for whom one of the neighborhood’s main thoroughfares is named. Planned for the site is Bartlett Place, a mixed-use development of market-rate, medium-income, and low-income residential units, artist live-work spaces, retail space, and a tentatively planned charter school with a focus on the arts. The developers — nonprofit Nuestra Comunidad Development in partnership with the for-profit Windale Developers – have said that they want to retain the arts-centric focus of the site, including a central public plaza with a wall for graffiti artists. Mark Matel, a project manager with Nuestra who was also instrumental in organizing the Events at Bartlett Yard, told the Globe’s Cristela Guerra, that the wall would be “a tribute to Bartlett Yard . . . A part of the identity and cultural branding of this community as a ‘creative village.’ ” Event organizer Turgeon suggested that with its mix of retail space, including a grocery store and restaurants, as well as the public plaza, Bartlett Place could help reknit together the Roxbury neighborhoods of Dudley and Fort Hill. It would be a place where neighbors could meet each other, outside of the often fractious environment of community meetings. And Matel says that plans are also in the works for “Bartlett Events II,” which would use remaining open space once construction begins. In the context of Boston’s byzantine public permitting process and fears about neighborhood change, the Bartlett Yard project has shown what can happen in a neighborhood not only because a few visionary organizers and artists wanted them to happen, but because city officials, developers, and residents were willing to let them happen.